By special request, here are five photos of the current state of our garden. The flexible downspout near the rain barrel is easily moved to the top when the barrel needs to be filled. Watering in dry weather from the barrel is easy with the hose. 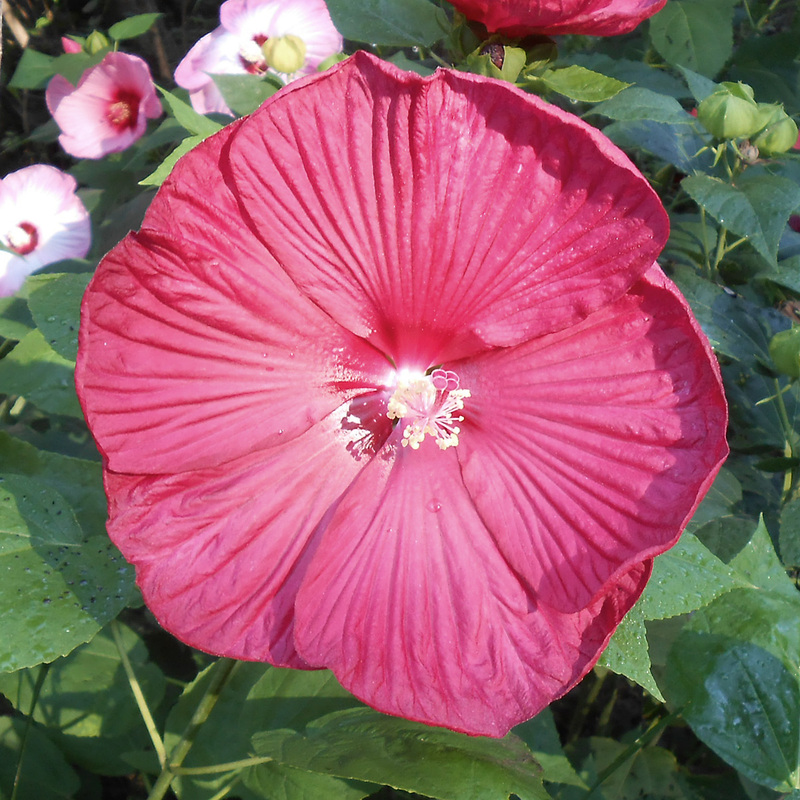 This entry was posted in Backyard and tagged Basil, Garden, Milkweed, Rhubarb, Tomato on August 18, 2017 by Jim R.
Our walking path takes us by the garden of a neighbor who has many Hibiscus plants nearby. We check on each pass to see which ones are in bloom. Their flowers are large and showy. Each is about 6 inches (15 cm) across. 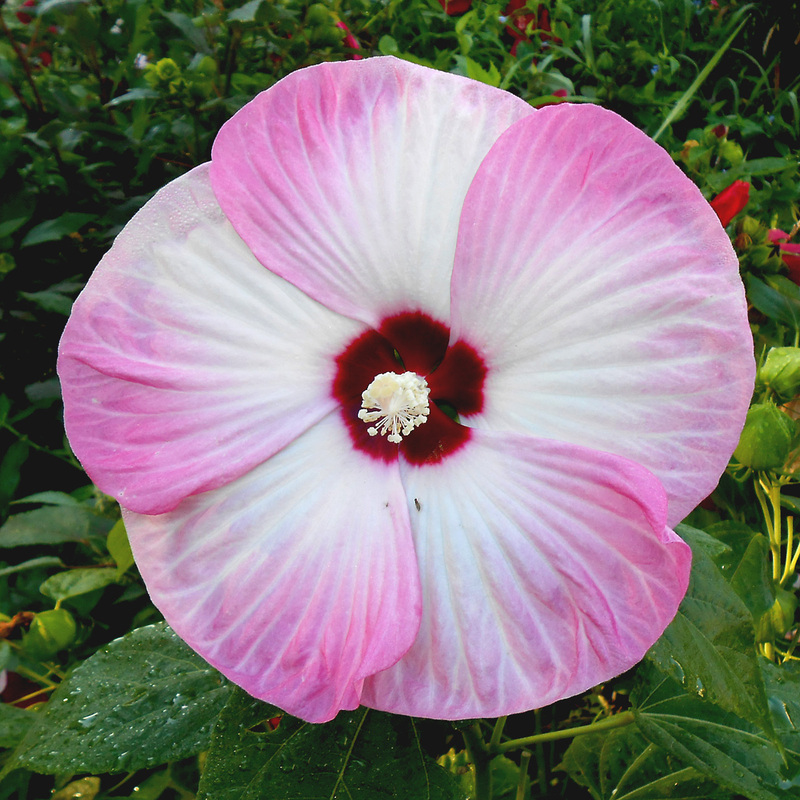 Some are deep red, pink, and white with different combinations. The link provided here has many interesting facts, a list of the many species, and photos of many of them. Click to embiggen any image. This entry was posted in Nature and tagged Flowers, Garden, Photography on August 14, 2016 by Jim R.
Bearded pendant petals adorn this iris beauty. There are hundreds of species of iris in nearly all colors. The name iris comes from Greek for rainbow. The sunlight was just right for this close shot. 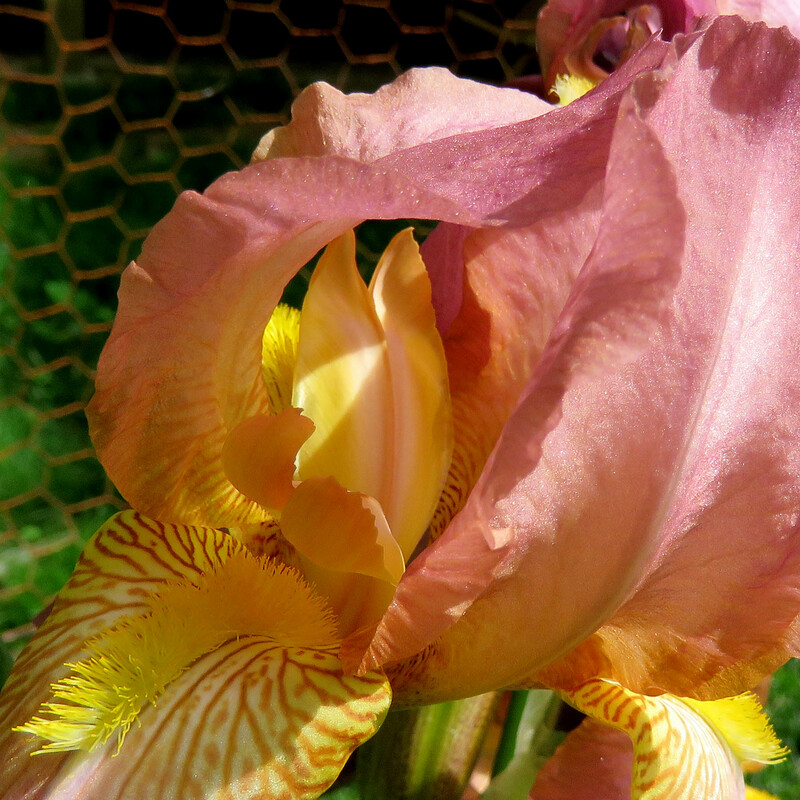 Passing deer often eat my iris blooms before they fully form. Not this year. I built a wire capsule to enclose them. Some of it is visible in the upper left. This entry was posted in Backyard and tagged Flower, Garden, Nature, Photography on May 24, 2016 by Jim R.
It was bound to happen. Cold air from the north arrived recently and killed the once tall and strong castor bean plant. It looked so sad. It will not regrow in the spring. I will see if the seeds are viable. The seeds never quite fully ripened. The prickly pods contain 3 in each. A few were starting to split. I cut off the long stalk of them for a closer look. Plus, they will be destroyed and not put out to the environment for animals or children to access. They are toxic. This entry was posted in Backyard, Nature and tagged Garden, Iowa, Plants, Poison, Ricin, Toxicity on November 9, 2014 by Jim R.
Good News: Lots of frost in the open areas. Castor is close to the house and was not damaged. We are nearing the dates of our first killing frost and hard freeze in Iowa. Here is the latest forecast this afternoon. We live one mile north of interstate 80. Bad news for Castor. The plant does not appear to care. It is bigger and stronger than ever. The last update 4 was September 14. Since then, we went to Oklahoma, New Mexico, back to Oklahoma, and now home. It continues to amaze. After our walk yesterday, I took this picture from the same vantage point as most of the previous ones. It didn’t give a good sense of perspective and size. So, I asked Melanie to take another. Can you can spot me in the photo. I am 5 ft 10 in tall in my shoes. A closeup of the seeds shows them still green. The entire bunch is 2 ft tall. I will need a chain saw and tractor to remove the plant before winter. This entry was posted in Backyard, Nature and tagged Garden, Iowa, Plants, Poison, Ricin, Toxicity on October 10, 2014 by Jim R.
Links to the Original post, Update 1, and Updates 2 & 3. The plant is now just short of 3 meters (~10 ft) tall. This view gives some perspective to the side of the house. The rain barrel is 1 meter tall. Prickly pods bearing three beans each are abundant. The structure is 0.5 meters tall (~1.5 ft). The tops of two other stalks are also bearing bean pods. It will take a while for them to dry. We’ve had over 15 cm (6″) of rain the past two weeks. That is not typical for the midwest in September. This is our 4th wettest summer on record in Iowa. The bean plant and everything else continues to thrive on the moisture. I’m getting tired of mowing the lawn. I watched an episode of Breaking Bad this week. Walter was intent on eliminating a drug lord by extracting ricin from castor beans. They dramatized the handling of the beans only using tweezers. They aren’t nearly as toxic as the show suggested. I don’t plan on testing that out. Before winter, I will clear the garden. The seed beans will be collected and disposed of so animals and children will not be able to access them. This entry was posted in Backyard, Nature and tagged Castor Bean, Garden, Iowa, Plants, Poison, Ricin, Toxicity on September 14, 2014 by Jim R.
I stood it up yesterday morning, packed the soil around the root ball, watered it well, and tied it to a sturdy steel post. It looks as if nothing happened. Twenty four hours after being down on the ground. It looks good. We had another inch of rain last night. That is twice this week. It is unusual for Iowa in the month of September to have that much rain. It made the ground soft. On our return from a morning walk, we noticed this unfortunate sight by the house. The castor bean fell over early this morning from the rain and wind. What a sad sight. It had been tied to a wooden stake as a precaution for this reason. That stake was too short now. It needed a strong metal fence post. I went to the back and got one. You can see it driven into the ground behind the toppled plant. 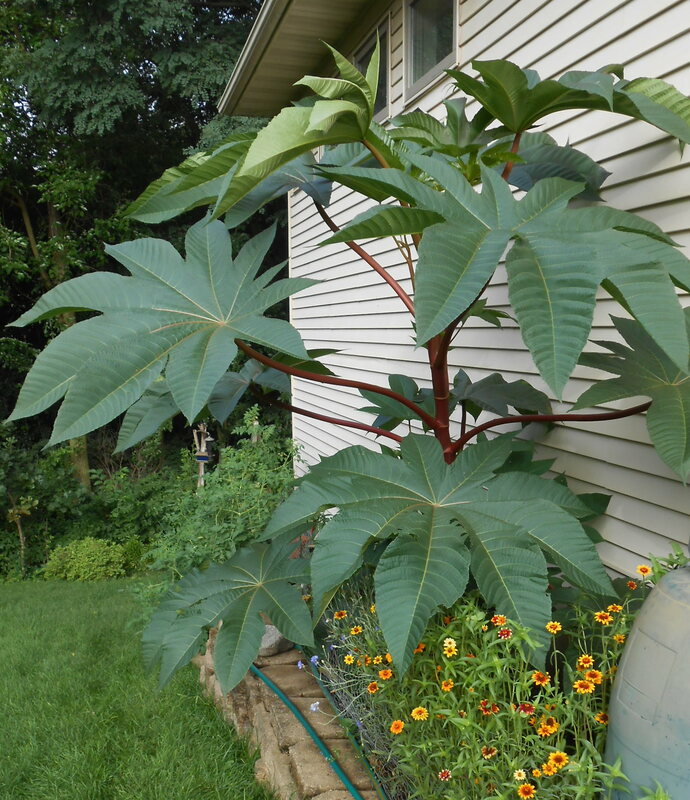 This entry was posted in Backyard, Nature and tagged Garden, Iowa, Plants, Poison, Ricin, Toxicity on September 5, 2014 by Jim R.
The castor bean plant is now over 7 feet tall. This picture is from the same spot as one take in the previous post two weeks ago. See farther down this page. Click on the image to see a much larger version. Show me more of this huge plant. 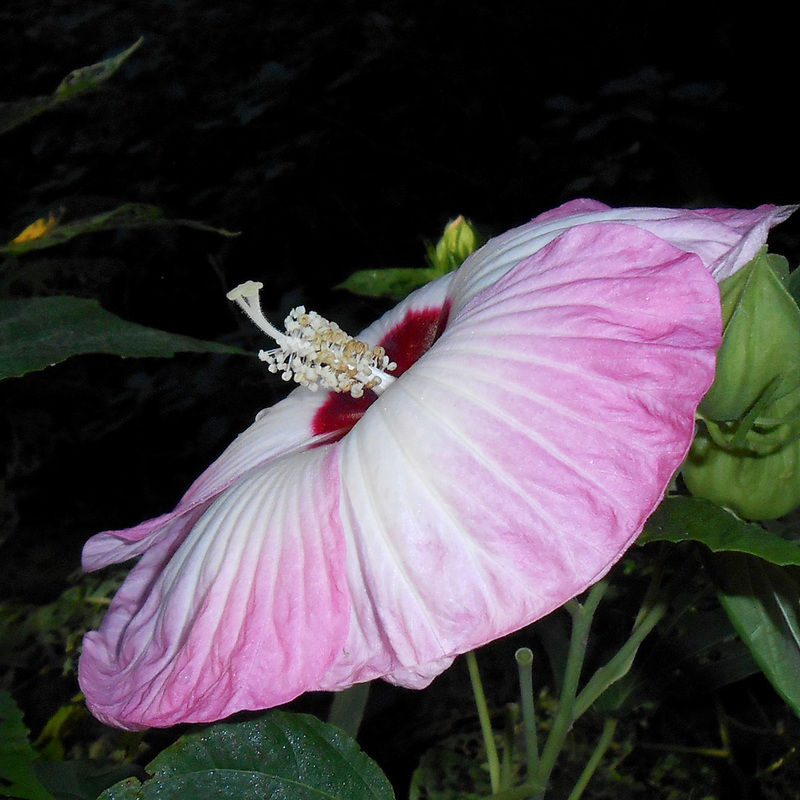 This entry was posted in Backyard, Nature and tagged Garden, Iowa, Plants, Poison, Ricin, Toxicity on August 25, 2014 by Jim R.
These photos were taken August 10, 2014. Castor Bean (Ricinus communis) was growing tall and strong. The top of the plant was 5 feet high. Yes, I do understand this plant is toxic. I remember that my mother grew some of these on the farm in Illinois when I was a kid. Their height of 10 – 12 feet was very impressive to a small boy. Some of the leaves are 2 feet wide. I like their pronounced vein structure. They are casting shade on the smaller pepper plants below. I was a skinny little kid. Mom was concerned that I was not eating enough. The doctor advised her to give me a daily large spoonful of castor oil just before the main meal. It turned out to be good medicine. It tasted so bad, I decided food was a better alternative. Very clever advice, doc. Did you know that the cartoon characters, Tom and Jerry, included awful tasting castor oil in one of their cartoons. More details can be found at this link. Updates to growth progress will come later. This entry was posted in Backyard, Nature and tagged Garden, Iowa, Plants, Poison, Ricin, Toxicity on August 14, 2014 by Jim R.
There is a patch of day lillies at the back edge of the yard. I keep them watered as needed by using my rain barrel. The deer have walked by the lily patch so often they have worn a path. Most years, they eat the fresh buds before they bloom, robbing me of the pleasure of seeing them in their glory. This year was no exception. Maybe I need a tall fence. A few years ago, our city offered to pay home owners half of the cost of rain barrels, butterfly gardens, rain water retention projects, etc., up to $750. I considered installation of a barrel before I read the announcement in the city newsletter. That news prompted me to go ahead with the plan. 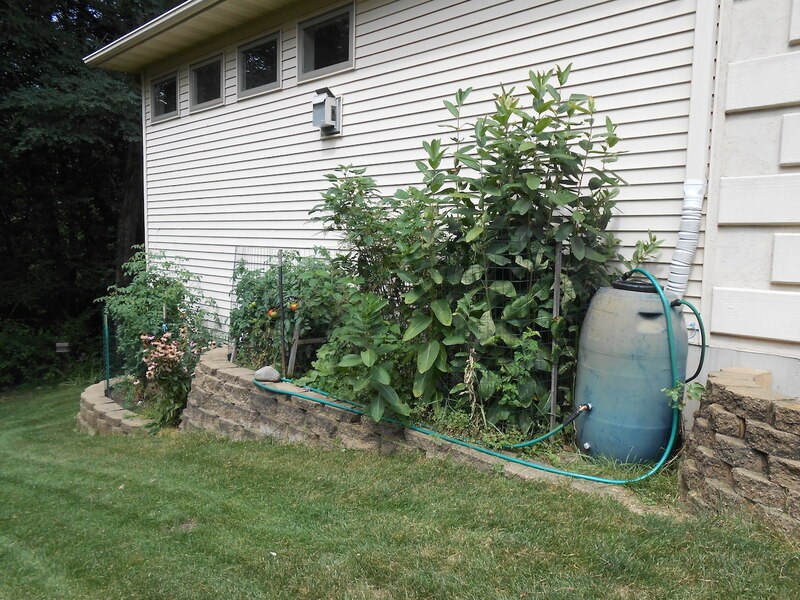 This entry was posted in Backyard and tagged Basil, Downspout, Garden, Garden hose, Home, Home and Garden, Rain, Rainwater tank, Rhubarb, Tomato on August 7, 2013 by Jim R.